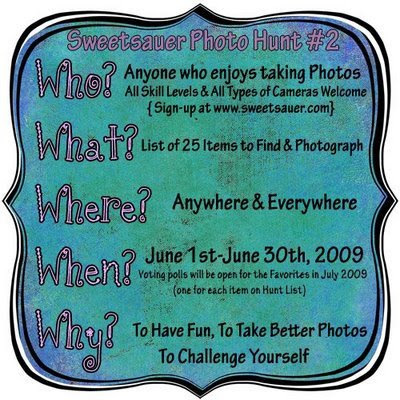 There is a new Photo Scavenger Hunt going on at Kirsti's. Click on the badge or on this link to find out who else is playing, and maybe vote for someone's pictures? I'm not really in it to win, because I hate to beg for votes each day. I decided I'm not going to do that anymore. I'm in because I love doing Scavenger Hunts, and I thought it would be nice to hunt for the pictures while on holliday in France and that I could spice it up with a little French touch. I think this series gives a great impression of Summer in Provence the way we have seen it and lived it these past two weeks. It is preferred that you take your photos between today and June 30th. If for some reason you are stuck on the 30th without a few of the items on your list, then you can use a maximum of two photos from your archives, as long as they were taken less than one year ago. It is up to you whether you post your photos on your blog as you go, or wait until June 30th to unveil them and make it a surprise. One thing I ask is that everyone who participates posts all 25 photos in one single post on their blogs or in a set in an online gallery by June 30th. 2. A Macro Shot: Laguiole cuttlery. 10. A Garden in Gordes. 12. A Street Scene in Cucuron. Do you see the electricity cables? 13. Signage: The French are very creative when it comes to advertising their business! 14. A Summer Activity: Nothing more French than "Jeu de Boules". 17. Air/ Wind: This is what the famous Mistral does with French laundry! 20. Something Vintage (pre-1980): I discovered that one, hidden in a garage in Banon. 21. Something Made of Glass: "Un petit blanc" at Tain l'Hermitage. So there, that's it from me, I hope you've enjoyed it! I took so many pictures, and I had so much fun looking for them, I could easily do another series of this! Well, maybe I will? Hi, it's me, I'm back from my holliday in France. First of all, I want to thank all of you, loyal visitors and followers of this blog for all the comments you left here while I was away. I can't begin to describe how much this means to me, and how much fun I had reading them all. It's been wonderful. But it's good to be back too. The weather was great, the food was divine, and the scenery, as always breathtaking. Lavender fields, poppy fields, sunflowers, old doors and windows. I promise I will ( try to ) catch up with all of you as soon as I can. Right now, there is so much "stuff" that needs my attention, I don't know where to start! If the car does not start, the driver could still walk, right? If you take into account which state some French cars are in, this does not come as a complete surprise! Did you know how I love doors? I have collected some real treasures over the years. Click the links to learn more about these pretty villages. I love everything about this beautiful region, so sharing five more favourite things is not hard at all! Favourite shop in Saint Rémy: Entre Sel et Terre. I love their wide range of salts and spices. Pastis. My favourite aperitif. There is nothing like it. The colour and the scent of a lavender field. I hope they are in bloom this year. Spring was very cold last year, so we did not get to see any. This picture was taken two years ago somewhere in the area of Sault. See you all again real soon!! If you've travelled to France before, you'll probably know using a French restroom CAN be a bit of a challenge. I rated this one five stars. And you know why? Because it's more or less clean? Uh-uh. The paper towels and the soap? Nope. Although I must add this is a rare luxury In France. No, wait ... not that one. Yes, they LOVE their Art in France. This is where they hid her!! This video might give you some idea of the force and the speed of the water of the well. This is how it looks only a couple of meters further downstream. When we were there, we heard a man had drowned there the previous day. They found his body about three kilometers up the river, and my mind boggles if I try to imagine the horror of this. What is with some people? Saturday Something I Think Should be Arrested. Friday's Fave Five, Life is Good. Time for an Award ... How About Two? Twice?